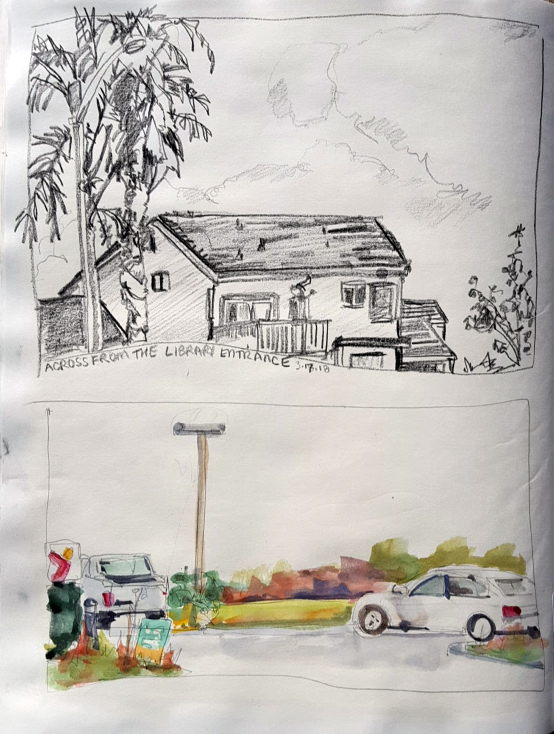 [By Lydia Velarde in San Diego]I attended an art reception at the library yesterday and sketched the scenery outside of the library entrance. I didn't go inside because I am the official "greeter" for the San Diego Urban Sketchers and this was one of our events. I worked with a Stabilo China Marker and watercolor. The sketchbook is a Daler Rowney 11 x 14, 65 lb paper. 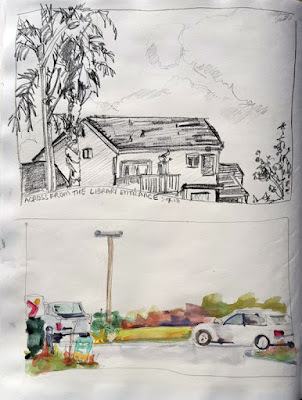 When I am drawing or painting on location I don't use a full page for each drawing because I don't carry my large brushes for location painting and I work with the sketchbook on my lap. I would probably get paint on my blouse. It was a bit chilly and many of the sketchers drew parts of the library, the people and even drew from books.